As anglers become more experienced with fish finding equipment, they often find that they would like access to more data than entry-level fish finders provide. While the basic sonar imaging technologies and rudimentary GPS capabilities provided by most such units are very helpful for casual anglers, advanced anglers often benefit from some of the cutting-edge features included with high-end sonar units. The Humminbird HELIX 9 Series is a great option for such anglers, and the various models within the product line provide a number of different options to suit all angling needs and budgets. The entire line is very impressive and earns an A- grade from Fishing Tech; but, we will examine one particular model in the series – the HELIX 9 CHIRP MEGA DI GPS G2N – in depth. The MEGA DI GPS G2N boast a number of very impressive features that will make it easier to find the fish and catch your limit. Although it is missing one helpful feature (more on this later), it has almost everything a modern angler would want, so we’ve given it an A rating. GPS capabilities are fairly standard among fish finders that cost more than about $200 to $300, and even a few entry-level units at lower price points provide basic GPS capabilities as well. However, the MEGA DI GPS G2N has an advanced GPS module that not only allows you to mark (and subsequently revisit) productive fishing locations, it also allows you to navigate major waterways with ease, thanks to its chart-plotting capabilities and included maps. In general, the higher the frequency emitted by a transducer, the more detail the fish finder is able to display. 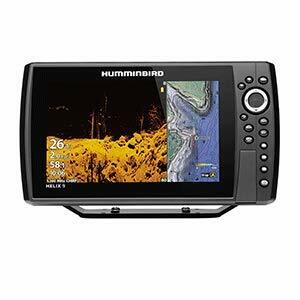 Humminbird has taken advantage of this fact by incorporating MEGA Down Imaging into the MEGA DI GPS G2N. MEGA technology uses frequencies that are up to three times as high as those emitted by traditional down imaging fish finders. This allows you to see unprecedented detail, including individual fish, rocks and baitfish schools, down to depths of about 125 feet. AutoChart Live allows you to create your own custom maps of your favorite waterway. Simply turn on the unit, and start cruising back and forth over the surface – AutoChart Live will handle the rest. With this function, you can map the depth of the water, bottom hardness or vegetation, giving you incredible insight into the world beneath the surface. You can even overlay LakeMaster or Navionics charts with your own custom maps. Like most HELIX product lines, their 9 Series fish finders are available in a variety of option packages. The HELIX 9 CHIRP MEGA DI GPS G2N is the second most feature-packed unit in the Humminbird HELIX 9 series, and it comes with most of the options available in the line. The most notable option included in the MEGA DI GPS G2N is the Mega Down Imaging module, which allows you to collect an incredible amount of detail on objects less than 125 feet deep. Mega Down Imaging is not available in any of the less expensive 9 Series models, which makes it one of the most eye-catching models in the HELIX 9 Series. However, it does not come with MEGA Side Imaging capabilities, as this is only available in the more expensive HELIX 9 CHIRP MEGA SI GPS G2N. The Humminbird HELIX 9 Series fish finders – especially the CHIRP MEGA DI GPS G2N – are packed with impressive and helpful features. A few of the most noteworthy capabilities and characteristics of the Humminbird HELIX 9 MEGA DI GPS G2N are detailed below. The 9-inch display screen included in the HELIX 9 Series fish finders produces high-definition images, which will allow you to notice more details than you would with standard definition screens. This is especially helpful for anglers fishing several feet from their screen, as they’ll still be able to see the information displayed on the screen. One of the most exciting features provided by the MEGA DI GPS G2N won’t help you catch more fish, but it will help you navigate better in foggy weather or during nighttime fishing trips. Capable of detecting objects up to 24 nautical miles away, the MEGA DI GPS G2N’s HD Radar system will help keep you safe while you search for the fish. All of the Helix 9 Series fish finders come with SwitchFire Sonar technology, which allows you to customize the way the sonar information is displayed on the screen. In the Clear Mode, screen clutter is reduced, allowing you to see clearly even in choppy water; by contrast, the Max Mode provides incredible amounts of detail in calm water, which you can use to alter your angling approach. The HELIX 9 CHIRP MEGA DI GPS G2N has two SD card slots, which allow you to save and upload more information than many other fish finders. One of the slots is dedicated to saving custom-made maps and other information, while the other slot allows you to upload or use advanced maps and similar data. Additionally, the SD Card Slots are located on the front, rather than the side of the unit. The entire reason you use a fish finder is to allow you to find and catch more fish, but entry-level models force you to analyze the data yourself. However, the HELIX 9 CHIRP MEGA DI GPS G2N uses SmartStrike technology to provide you with this kind of analysis at the touch of a button. Utilizing seasonal, weather and lake data, SmartStrike will recommend some of the best locations to fish in any body of water. Anytime you are trying to select a good fish finder (or any other piece of fishing gear), it’s a good idea to compare the model you have your eye on with other, comparable units. This includes both those made by the same manufacturer as well as a few models made by other companies. 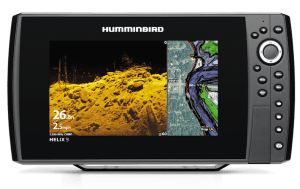 The Humminbird HELIX 9 CHIRP MEGA DI GPS G2N is the penultimate model in the HELIX 9 Series, so you can opt for models at higher and lower price points. The HELIX 9 CHIRP MEGA SI GPS G2N costs a few hundred dollars more than the MEGA DI GPS G2N model does, but you’ll get access to side imaging data with the more expensive product. You’ll have to decide if you need side imaging capabilities and whether it is worth spending an extra money for this feature, but both models are otherwise identical. If you would like to save about $100, you can select the HELIX 9 CHIRP DI GPS G2N. With this model, you’ll have to settle for traditional (rather than MEGA) down imaging capabilities to do so, but this may make sense for some anglers. The map software included in the CHIRP DI GPS G2N is different than that included in the DI GPS G2N, but because of the dual SD car slots, you can change this software at a later date. Everyone wants to save as much money as they can on fish finders, but when you are spending nearly $1,000 on a unit, you should probably try to get one with every feature you’d like (such as MEGA DI), rather than trying to save 10%. Accordingly, the HELIX 9 CHIRP MEGA DI GPS G2N is probably the best option in the HELIX 9 Series for those who do not want to spend the extra money to get side-imaging capabilities. There are a few other fish finders on the market that are broadly similar to the HELIX 9 CHIRP MEGA DI GPS G2N, but despite their similarities they exhibit a number of important differences. Two of the most similar products include the Raymarine AXIOM 9 RV MFD and the Lowrance HDS-9 Gen3. Both the Raymarine and Lowrance models are about a few hundred dollars more than the Humminbird fish finder, when similarly equipped. Each of these units features a touch-screen interface, rather than the traditional buttons which are used to navigate the Humminbird model. There is nothing inherently superior to either system, and it is largely a matter of personal preference. Nevertheless, anglers who frequently wear gloves may appreciate traditional buttons, as touch screens rarely work well with gloved fingers. The Lowrance model offers more mapping and chart-plotting capabilities than the HELIX 9 CHIRP MEGA DI GPS G2N, and it also works with a number of Lowrance performance modules, giving you access to things like broadband radar and marine audio information. Meanwhile, the Raymarine fish finder features an all-glass display and a sleek operating system, which many users have found easy to use. Nevertheless, because both of these units will cost you a couple of hundred dollars more than the CHIRP MEGA DI GPS G2N, most anglers will be best served by the Humminbird product. The only caveat being that anglers who prefer touch-screen interfaces may want to give the Raymarine and Lowrance products more serious consideration. See our Lowrance HDS-9 Gen3 review. 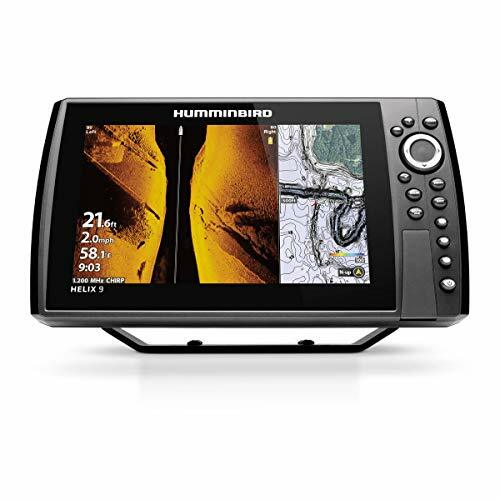 If you are ready to step into the world of high-definition, 9-inch screens, and you would benefit from the detailed images provided by the MEGA down-imaging feature, the Humminbird HELIX 9 CHIRP MEGA DI GPS G2N is a great option. It includes some pretty great features and is relatively affordable. There are few other fish finders on the market that offer similar capabilities at the same price point, and the only real feature missing from the unit is side imaging.